Please join me this Thursday, December 7, at the San Francisco Women Artists’ Gallery for the festive opening reception of “Small Presence” – a juried exhibition featuring 100 artworks. In addition to the show, my photographs “Portraits of Birds in Golden Gate Park” are featured in the back salon. Meet the artists and enjoy the art, refreshments and live music. The gallery has gifts for the holidays, including jewelry, sculpture and ceramics. 647 Irving Street at 8th Avenue (Inner Sunset), 5:30pm until 8pm. Come join me and the artists at the San Francisco Women’s Artists Gallery for our next show: Reflections. The summer of 2017 is turning out to be a Humpback whale extravaganza in the San Francisco Bay. Yesterday, I saw five whales spouting, breaching and eating for about two hours. With wildlife so close to our urban world, who doesn’t want to marvel at these behemoths jumping out of the water? While they can dance above water, they can’t write to ask our President to keep their marine ecosystems safe from drilling. That’s where we come in. In April, in efforts to “Implement an America-First Offshore Energy Strategy,” the Trump Administration called for the Department of Commerce to conduct a review of National Marine Sanctuaries and Marine National Monuments Designated or Expanded Since April 28, 2007. This is known as Executive Order 13795. Sanctuaries are like underwater national parks, protected from offshore drilling, that provided feeding and breeding for whales, sea lions, elephant and furs seals, sharks and all sorts of birds. There are 11 sanctuaries that were expanded or created in the last 10 years. It appears that President Trump is trying to rescind that work so that off-shore drilling can occur in these areas. The ones that are under review on the California coast are the expanded Cordell Bank, Greater Farallones, Monterey Bay, and Channel Islands National Marine Sanctuaries. Tell President Trump that the California’s National Marine Sanctuaries create a vital ecosystem that provides our wildlife with the food that they need to flourish, that these marine ecosystems are vital to the health of marine mammals, fish, birds and other wildlife. And that because of these sanctuaries, you are enjoying all that these ecosystems sustain. Tell President Trump that you strongly support the current sanctuaries and that the health of these underwater parks provide people from all over the world the opportunity to see stunning wildlife. Tell him that our economy relies on the beauty of our coastline. Ask President Trump not to undermine the agreement that citizens have made to protect these areas. Extensive public input was reviewed before these areas were expanded. The government should not weaken these agreements. I just added my comment. At that time more than 14,000 people had added theirs. You must act quickly as the comment period ends July 26. The whales will be grateful. This time of the year, California is a stop-over point for birds heading down to their wintering range. Watching birds fly in groups over the ocean or land is a spectacle of beauty that I seek out each year. This past weekend, I headed over to a brickyard in San Rafael, where Vaux Swifts stop off for a couple of nights on their way down to Central America. Below is some video footage that I captured from that day, with some birders at the site calculating that there were more than 20,000 swifts trying to get into one brick chimney. We waited until dark, and there were still thousands of birds milling around. Rumors were that the chimney was filled to capacity and that this was the largest congregation of birds they had ever seen at this site. By 8pm, the wind had picked up so we left the birds, flying around like an insect swarm in hopes that some space at the chimney would open up. There are secret beaches and caves that appear out at Point Reyes when there is a negative tide, which is when the water is below the usual tide line. In May, a small group met at 6:30am to trek the 9 miles out to the secret beaches and caves in a secret location at Point Reyes. Along the way, we saw tidal pools filled with thousands of sea urchins and underwater terrain that isn’t usually visible. Rocks and secret caves appear on the beaches, which are also not usually available. That day we were lucky enough to see 13 grey whales heading north. I believe there is no place quite as beautiful as Northern California in the spring. The beginning of our trek, a nine-mile round-trip walk to find the secret beaches and caves. Treacherous paths to the secret beaches. We passed through this arch, a careful and kind of scary process. Sea urchins revealed at a minus tide. Underwater habitats revealed at a minus tide. One of the arches we passed through to get to the secret beaches. A secret cave, only at minus tide. Our leader, Frank, explaining how caves are formed. A look up from inside the cave. Crawling out from one of the caves. Amphitheater at one of the secret beaches at Point Reyes. A close up at rocks exposed on the secret beach. We scrambled around that outcropping to get to a secret beach. We turned back just in time to not get stuck out there as the tide came in. 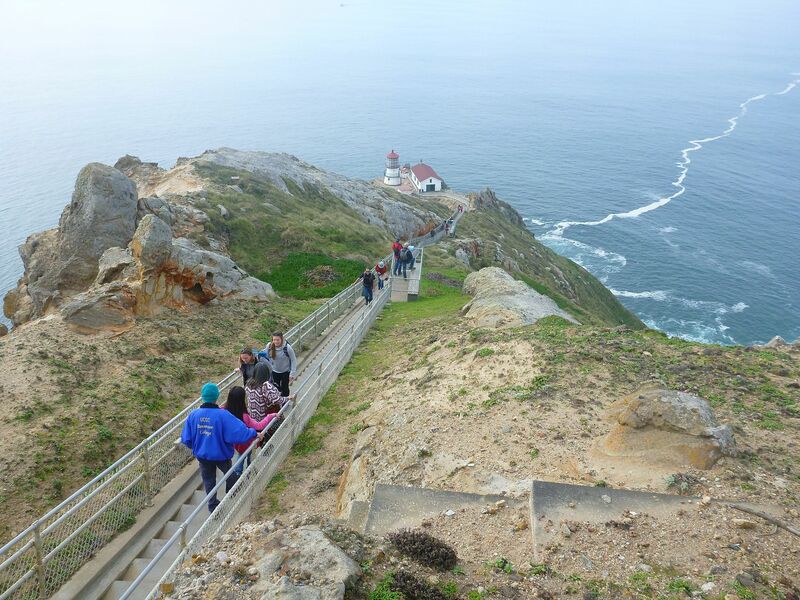 Anyone who’s traveled to Point Reyes more than once realizes that the weather is completely unpredictable. This is my fourth year as a docent, and still can’t predict how the weather will play out during the day. I always bring four layers of clothing, including long underwear, fleece, my Gore-Tex jacket and some mittens. But January 4, my first day of being a docent, was incredibly clear and warm. We saw 28 whales in the morning shift at the lighthouse. Seeing whales is kind of an exaggeration, as anyone who has been up to the lighthouse knows. Mostly what we see is a faint view of a dark back and maybe a fluke (tail). We often see a light blow of air every once in a while. But even that slight indication that there’s a forty-ton mammal beneath the surface excites visitors from around the world. Some complain that they don’t see more. “That’s it?” they exclaim, imagining that they’d see a whole body coming out of the water instead. Peregrine Falcon on his rock. The local Peregrine Falcon has a rock that he stations himself on, scanning the landscape for intruders into his territory. We watched him attack a juvenile Red-tailed hawk. He was vocalizing loudly and then swooped the bird, which was sitting on a cliff about 200 feet from the Peregrine. He circled around and swooped the Red-tail again, vocalizing loudly the whole time. A scene better than any National Geo special I’ve seen online. The crowd was transfixed by the beauty of the Peregrine. The ranger later told me that this conflict had been happening for at least three weeks, and that they had seen the Peregrine tackle the Red-tail on the ground. They rolled over together. But that hawk keeps returning to the Peregrine’s territory, where they have a nest. Visitors walking down to the Pt. Reyes Lighthouse. That’s just some of the morning excitement. I missed the long-eared owls that another docent saw on her way over to our next station. We moved over the Chimney Rock overlook, where we found the Northern Elephant seals, primarily males with some females and newborn pups. It was slow and quiet among the crowd of mammals on the beach, though we knew in a few weeks that the beach would be noisy with new-born pups, vocalizing females and bellowing males. 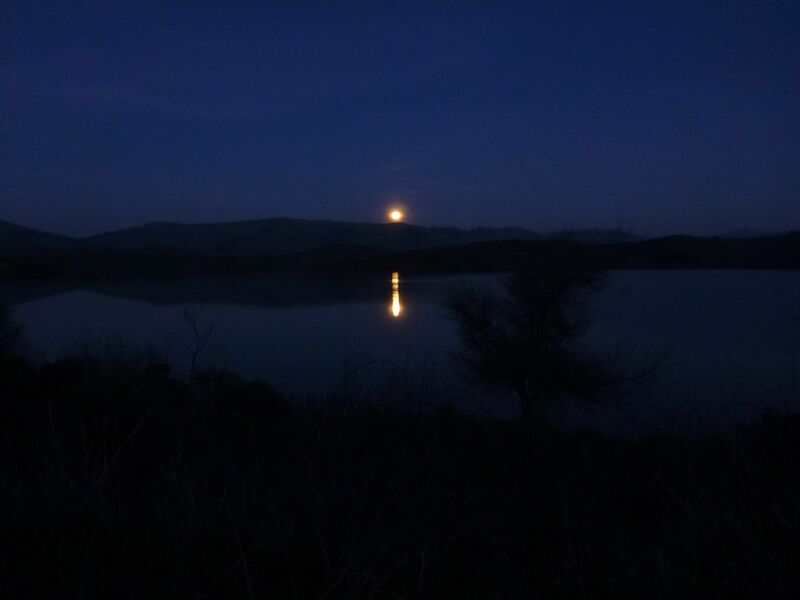 On our ride home we witnessed a full radiant moon, reflecting on the reservoir as it rose into the darkened sky. Ocean Beach offered up all sorts of uncommon visual marvels this past Tuesday, including Vellela (commonly known as by-the-wind sailor), different types of algae, and remnants of all sorts of hard-shelled creatures. Nature created the compositions the way that I’ve captured them here. I haven’t styled any of these photos. I invite you to enjoy the beach’s beauty. On Thursday, May 16, the Skulls exhibit will open at the California Academy of Sciences in Golden Gate Park in San Francisco. The exhibit features a collection of skulls that will provide a fascinating look into nature’s engineering while telling us all about the lifestyle of many animals. Perhaps as fascinating (if not more) is the story of the man who collected the majority of the skulls in this exhibit. At 86 years old, Ray Bandar has been collecting skulls for Cal Academy for more than 60 years. Many of the skulls he collected (approximately 7,000) are in his house in what he calls his Skull Palace, a basement room stacked high with bones and skulls. The exhibit will have a selection of those skulls along with hands-on activities for all ages. My favorite part of the exhibit features a wall of sea lion skulls. The diversity of those skulls is remarkable as it tells the story of individual variation in one species. In front of that wall of sea lions is a video featuring Ray Bandar, much of it from my movie, Ray Bandar: A Life with Skulls, which I began back in 2003 when I first met Ray. The inspiration for the movie occurred when I was on a backstage tour of the last Skulls exhibit at Cal Academy. During my tour, Ray told his bounty of tales with a boyish exuberance that I felt I needed to capture on video. He brought every skull to life with a tale: mammals dying because their horns locked when they were fighting, marine mammals with shotguns shells in their heads, how dogs represented man-made evolution and bears that had become obese on human food. In search for a complete story about Ray’s passion, I interviewed his friends, colleagues and wife and followed him out on an excursion to collect the skull of a harbor porpoise. My own three-year journey with Ray would eventually turn into a 30-minute movie called Ray Bandar: A Life with Skulls, which was shown on PBS. You can buy the movie (with an hour of extras), from Amazon.com. Chimney Rock overlook with this year’s elephant seal weaners. Panoramic view of Drake’s Bay. 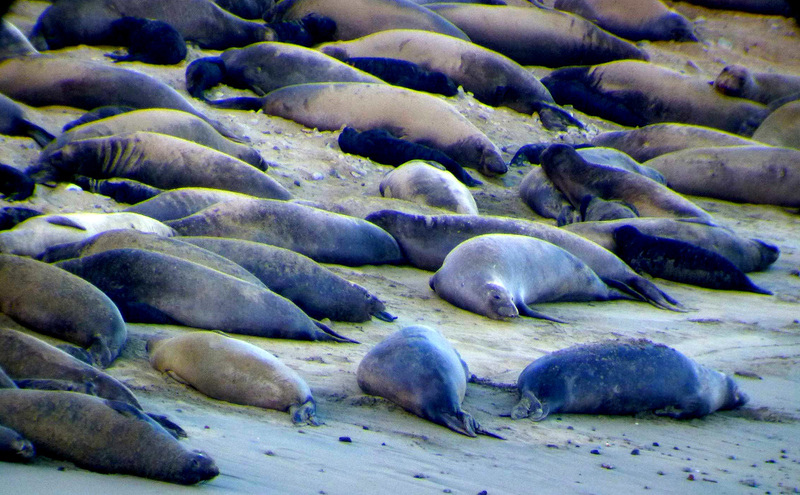 This year’s elephant seal colony at Chimney Rock overlook. The Boathouse from Chimney Rock. A smaller elephant seal haul out. 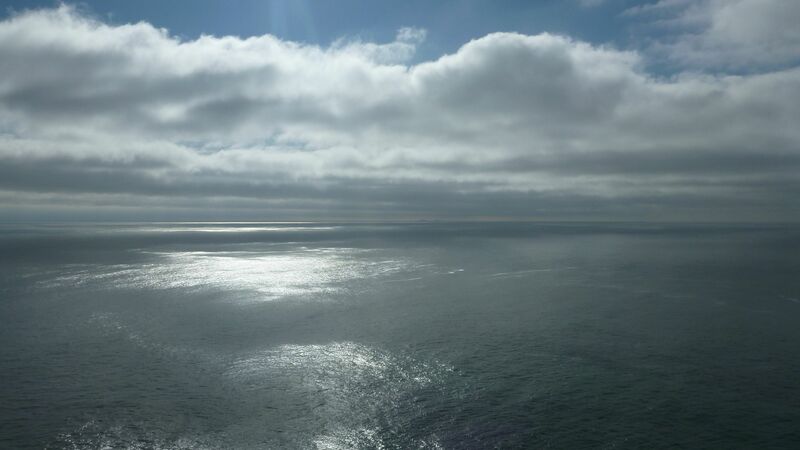 A view of the Pacific Ocean from the Point Reyes Lighthouse. A deer on its way. The Great Beach at Point Reyes. 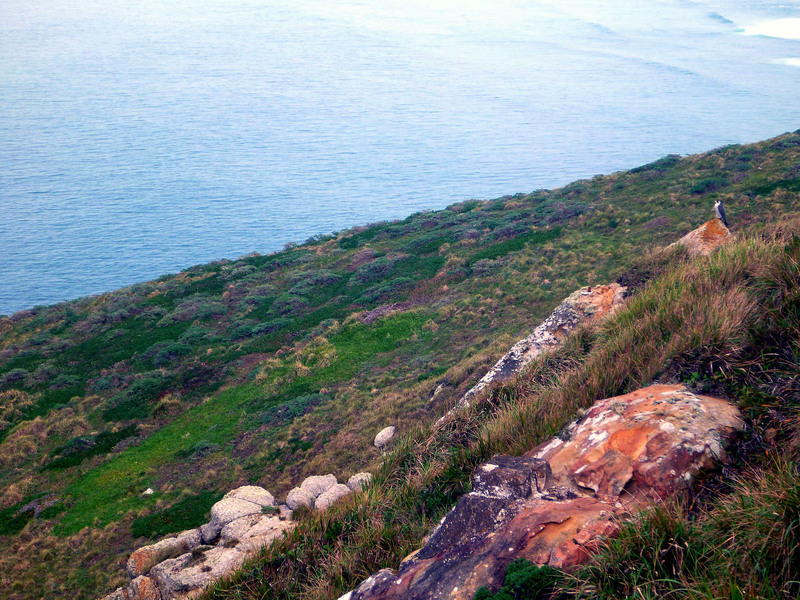 The only sadness that spring brings for me is the end of my Winter Wildlife Docent days up at Point Reyes. Today was the last day that I spent talking to visitors about whales and elephant seals and whatever other topics came up (i.e., hunting white-tailed deer, smart birds, the appearance of orca whales, the anger of those left behind to endure winter in Minnesota, the grace of being relocated to California from Cleveland, Ohio). 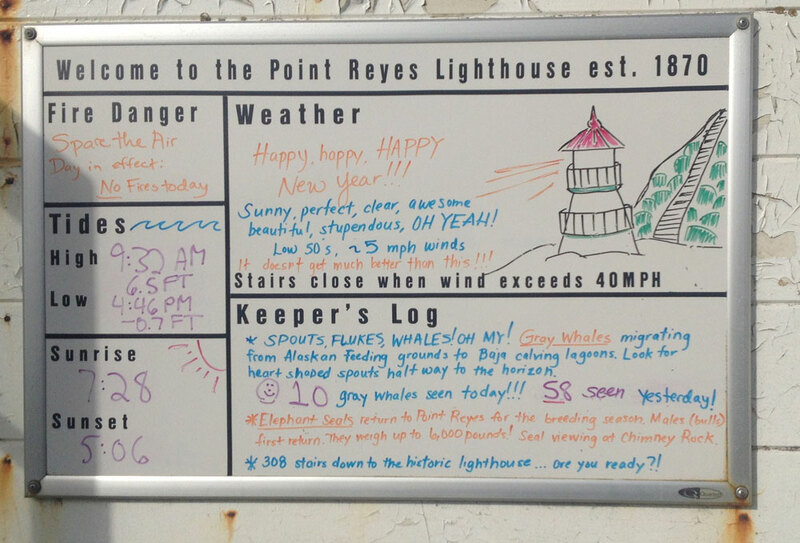 And what a day it was at Point Reyes. Not only were the whales passing by the Lighthouse (we saw eleven in the morning), but this year’s Elephant Seal weaners were playing in the surf, fighting and making their way out into the ocean that they will soon call home. On top of those usual findings were an abundance of wild flowers, visits from many birds (Surf Scoters, Brown Pelicans, Common Murres, Caspian Terns, Peregrine Falcons), and brilliant vistas all around. Some unidentified fishes were splashing in Drake’s Bay. No one was able to identify exactly who they were since it was the first time anyone had seen them before. One of the best aspects of being a docent up there is that visitors from around the world see California wildlife for the first time. Locals come, too, and marvel that they don’t go out to Point Reyes enough, perhaps spending too many Saturdays at home relaxing with their NetFlix movies. On damp, windy days visitors may ask us docents why we volunteer to come up in this weather and stand around for hours talking to strangers. I tell them about the beauty and perfection of what we see before us. How the commitment to do this volunteer work makes us all come out here to watch the bounty of nature unfold. Many still don’t get it. Perhaps they prefer the warmth and comfort to the raw qualities before us here in Point Reyes.